Admission：Adult: ¥1,000 (¥800)／Students: ¥800 (¥640)／Junior ＆ senior high school students, people aged 65 or over: ¥700 (¥560) *Free Admission on October 1st, the Tokyo Citizens Day. 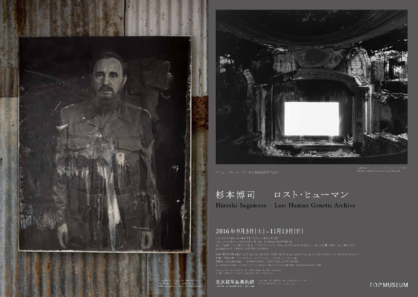 The Tokyo Photographic Art Museum will hold the ‘Hiroshi Sugimoto: Lost Human Genetic Archive’ Exhibition to celebrate the museum’s Grand Reopening and 20 Year Anniversary. Hiroshi Sugimoto is an artist, based in New York since the 1970s, who uses a large-format camera to produce minutely detailed photographic series, such as his ‘Dioramas’, ‘Theaters’, ‘Seascapes’, etc., for which he has received international acclaim. In recent years he has presented exhibitions based on historical research while also applying himself to architecture, both in Japan and abroad, exerting a powerful influence in a wide variety of fields, ranging from contemporary art and architecture to design. This exhibition will occupy two floors of the museum; dealing with the epic theme of ‘the demise of mankind and civilization’, it consists of three bodies of work: the world’s first showing of his latest series, ‘Abandoned Theater’, the first Japanese showing of his ‘Lost Human Genetic Archive’ and a new installation work entitled ‘Sea of Buddhas’, which together present the artist’s view of history and the world. The exhibition starts by presenting 33 scenarios describing the end of civilization. With Sugimoto’s text, ‘Today the world died. 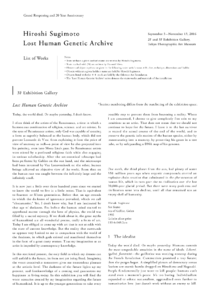 Or maybe yesterday’, in hand, the viewer can walk around installations based on history or civilization in which ‘the idealist’, ‘the comparative-religion scholar’ and ‘the astrophysicist’ have been reduced to relics. This is the new, Tokyo version of a work that received high acclaim when it was first shown at the Palais de Tokyo (Paris) in 2014, and comprises of his own work, antiques, fossils, and books or historical material collected by the artist. The story is imaginary, sometimes humorous, but when we realize the history behind the objects on display, we are forced to reconsider the civilization we have created, our awareness and contemporary society. This exhibition will also include the world’s first showing of the photographic work, ‘Abandoned Theater’. This is a new series that evolved from the ‘Theaters’ series that he has worked on since the 1970s. For it, he visited movie theaters across the U.S.A. that had become disused for economic reasons or the sudden change in the viewing environment, etc., putting up new screens and projecting movies onto them, keeping the shutter of his camera open for the whole duration of the film and recording the light that is transmitted to the screen. Utilizing a large-format, 8x10 camera and a minute printing technique, the works confront the viewer with the faded glory of these beautiful interiors, bringing back to life the history and profound tranquility of the spaces. The vivid whiteness of the shining screen, is actually the aggregate of countless stories, making us realize anew that photography creates a record of time and light, taking our awareness beyond the framework of civilization or history and leading it to the concept of time itself. This idea is taken even further in the ‘Sea of Buddhas’, which takes us to an image of the Buddhist paradise. The statues featured in this work belong to the Sanjūsangen-dō temple in Kyoto that the artist spent over ten years photographing. They were created during the Heian period (794-1185), in what were described as the ‘latter days of Buddhism’, but they have transcended time to be reborn within this new installation work. Sugimoto’s latest works present us with a valuable opportunity to contemplate the future in order to ensure that humanity and civilization do not become mere relics of the past. The exhibition starts by presenting 33 scenarios describing the end of civilization. With Sugimoto’s text, ‘Today the world died. Or maybe yesterday’, in hand, the viewer can walk around installations based on history or civilization in which ‘the idealist’, ‘the comparative-religion scholar’ and ‘the astrophysicist’ have been reduced to relics. 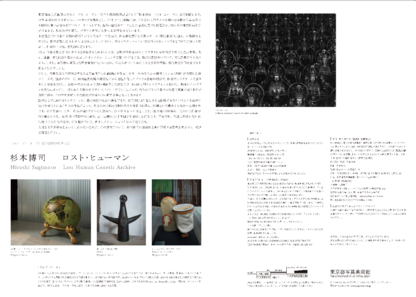 ■Cosponsored by:Corporate Membership of the Tokyo Photographic Art Museum, etc. ■Cooperation:Odawara Art Foundation; Yamato Logistics Co., Ltd.; Nippon Cargo Airlines Co., Ltd.; Kamogawa Shoten Co., Ltd.; KORG Inc.; Yebisu Garden Cinema; etc.